As a provider of distributed denial of service (DDoS) mitigation services, Black Lotus is in a unique position to observe and collect real time data on the threats facing service providers, enterprises, and government agencies. 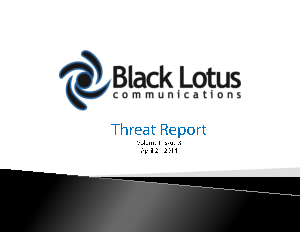 Black Lotus predicts that while the NTP DrDoS threat which became prevalent in January and February 2014 have been successfully contained through the combined efforts of the security community, that new DrDoS threats will emerge resulting in attacks in excess of 800 Gbps in the next 12 – 18 months. Download the threat advisory now to find out more.